European elder is a tree native to Europe and parts of Asia and Africa, and it also grows in the United States. There are several different types of elder, such as American elder, but European elder (Sambucus nigra, or Black Elder) is the type most often used as a nutritional supplement. European elder grows as either a large bush or small tree, and is characterized by clusters of dark-red berries that turn black when ripe. Parts of the elder tree—such as the berries and flowers—have historically been used for immune stimulation, against pain, swelling, infections, coughs, and skin conditions. Current folk or traditional uses of elderberry and elder flower include flu, colds, fevers, constipation, and sinus infections. Elderberries are rich in antioxidants—substances that may help prevent or delay some types of free radical damage to cells. Free radicals can cause “oxidative stress,” a process that can trigger cell damage. Oxidative stress is thought to play a role in a variety of diseases including cancer, cardiovascular diseases, diabetes, Alzheimer’s disease, Parkinson’s disease, and eye diseases such as cataracts and age-related macular degeneration. Antioxidants are free-radical scavengers that have been shown to counteract oxidative stress in laboratory experiments. Elderberries are a terrific source of polyphenols, such as anthocyanins and flavonoids. These are potent antioxidants. Polyphenols are found in many plants and gives some flowers, fruits, and vegetables their color. If you’re like most people, you know at least one person, maybe even yourself, that’s gotten sick with an upper respiratory infection when they fly on a plane. Statistics from the Centers for Disease Control and Prevention back this up—about 20 perent of all air travelers experience respiratory infections that require them to seek medical care. Elderberry to the rescue! A study was recently published in Nutrients that followed air travelers for two years. One group was given a proprietary elderberry formula, and the other group took a placebo. 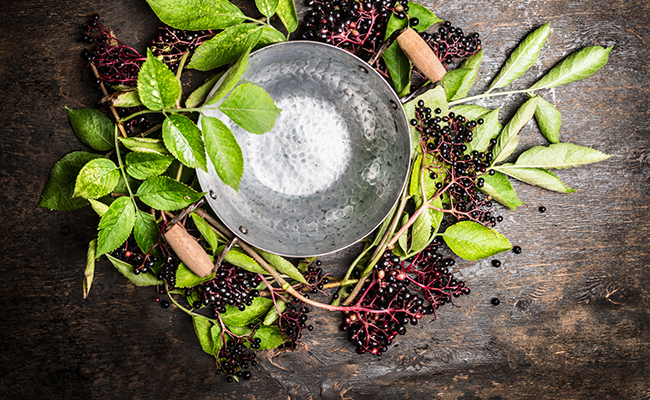 If participants in either group contracted a cold, those who took the elderberry formula were sick for only 5 days, versus 7 days in the placebo group. The elderberry group also reported far less severe symptoms and experienced better overall health after their travels. The same elderberry formula used in this trial was previously the subject of a clinical study by Dr. Christian Krawitz at the University of Giessen. In that study, the formula was found to have clear inhibitory effects against influenza A and B viruses, as well as against four bacteria known to cause upper respiratory infections. Vascular disease includes any condition that affects the circulatory system. The inner layer of the blood vessels is referred to as the endothelium. According to a recent study in Free Radical Biology and Medicine, elderberry anthocyanins can protect the inner layer of blood vessels from oxidative stress. The researchers concluded that elderberry extract “conferred significant protective effect against oxidative insult.” This is an important finding because the more protected the blood vessels are against oxidative stress, the greater their integrity and structure, which improves blood flow throughout the body. According to the American Diabetes Association, a staggering 29 million Americans have diabetes. It’s no wonder that researchers are scrambling to find treatments to help manage what is fast becoming an epidemic. Traditionally, elderberry is one of many herbal treatments that have been studied to help manage blood glucose levels. For example, according to a recent study in Phytotherapy Research, substances such as naringenin and linoleic acid in elderberry juice may activate insulin-dependent uptake of glucose, which could help manage diabetes. Herbal treatments for diabetes holds promise—the World Health Organization recently called for more research to be done. Because of elder flower’s possible diuretic effects, use caution if taking it with drugs that increase urination. Tell all your health care providers about any complementary health approaches you use. Give them a full picture of what you do to manage your health. This helps to ensure coordinated and safe care. Do not stop taking any medications prescribed by your physician unless your healthcare provider directs you to do so. Thanks, don't think I have ever had elderberries. Loved this article! You might be interested in Norm's Farms (normsfarms.com)- they're a small batch, sustainable Elderberry producer in North Carolina. They make Elderberry Extract, a Wellness Syrup, Elderberry jams, etc. using American grown elderberries (most elderberry products on the market are made from European grown elderberry, meaning they have to travel a long ways and use lots of fossil fuels to get here). They also operate their own organic Elderberry farm using only restorative growing practices. So glad to see folks reconnecting us with the powerful benefits of Elderberry!